Please join me in welcoming NRN’s newest blog, Ambience Chaser. It’s written by my soft-spoken but quietly brilliant colleague Elizabeth Licata, whose humor you will very likely enjoy and whose insights you’ll no-doubt appreciate. Already she has a video of a magical expanding table, as well as an appreciation for blowing things up. My summer drink of choice is iced coffee — black, unsweetened. It tastes like cold anger, and for some reason that appeals to me when it's hot outside. In the two (2) blocks from my subway stop to our offices, there are five (5) chain restaurants and at least two independents where I can get iced coffee. At Dunkin’ Donuts I order a large black iced coffee, they ask if I want sugar, I tell them I don’t. At Pret à Manger I order a black iced coffee, because they only have one size of iced coffee. They get it without discussion and wish me well. At Starbucks I order a venti unsweetened iced coffee, and the baristas can't help themselves: They have to add another "iced" to the drink’s description when announcing that it’s ready. “Iced venti unsweetened iced coffee,” they say. So I guess it’s good Starbucks language. You could even argue that the first “iced” is meant to go with the “venti” to describe the cup size, and then the second “iced” describes the temperature of the drink. Even so, it’s bad English. Double use of the same word in a sentence is kind of an old joke. I first heard it probably in the early 1980s with the phrase that is the title of this blog entry, possibly from George Carlin. The gag was used quite effectively in the 2004 movie Dodgeball. That game is, of course, the province of thugs and bullies who delight in causing pain to those who are smaller, slower and weaker than they are, and can think of no more clever way to do it than to fling balls at them. So naturally its advocates and historians — which all sports have — are dimwits who declare that true dodgeballers must learn the five d’s of the sport: dodge, duck, dip, dive and dodge. The gag has been repeated again recently, in Joss Whedon’s viral video phenomenon Dr. Horrible’s Sing-Along Blog, in which Dr. Horrible, played by Neil Patrick Harris, is aspiring to join the Evil League of Evil, which as far as I can tell is a cabal of the sorts of social misfits who would be on the losing end of a dodgeball game. They’re anarchists, but they’re not stupid, and certainly clever enough to notice that “evil” is used twice in their club’s four-word name. But it does sound good, doesn’t it? Evil League of Evil, iced venti unsweetened iced coffee. Part of the same linguistic shift? You decide. Speaking of Starbucks and other chain restaurants, please allow me to link to a story in this week’s Nation’s Restaurant News about customers’ reactions to New York City’s new regulation requiring chain restaurants to post calorie information on their menus and menu boards. I certainly hope you enjoy it. Food-in-film note: Dr. Horrible buys a frozen yogurt for his love interest, Penny (who of course is infatuated with his nemesis, Captain Hammer). He pretends he was given two yogurts when he only ordered one, because he’s so shy, so insecure, that he couldn’t possibly risk the rejection that could come from showing enough interest in Penny to buy her a snack. It looks like a Pinkberry-style yogurt, plain and tart. Inexplicably, they eat it with a spork, allowing Dr. Horrible to stab himself in the leg with it in frustration. August 18 update: “I-V-I-C,” my Starbucks barista said to me today, handing me my venti iced coffee. I repeated it back to him, but as a question. “Iced venti iced coffee,” he said, as though I were dumb. I pointed out that both of the i's stood for “iced” and that he only needed one of them. So I was right. I have innate knowledge of Starbucks language even though I have never worked there. I’m not sure how I feel about that. Michael Bao Huynh is still at Bún, kind of, or perhaps as much as he ever was, I’m not sure. “He’s my brother,” said Tony Lam, who owns the place and does the food. Huynh’s a partner there, but his day-to-day involvement is minimal, except perhaps when Tony’s out of town. And maybe not then, either. (click here if you’re curious about this topic, otherwise read on as I am about to change the subject). Because although Tony conceptualizes the food, he trains cooks to cook. He doesn’t do it himself. Bún has a new publicist (Susan Rike), and often with a new publicist comes a new round of press dinners. Susan’s press-dinner style is to round up four to eight journalists and bring them all to dinner at once, in a group. She tends to do three such dinners per restaurant. Group dinners can, of course, be deadly, but there’s always the off-chance that you’ll meet someone interesting at them, and I have met a number of interesting people at Susan Rike dinners. She tends to draw an eclectic group. I already knew (and like) the three other journalists at dinner last night, and so I could focus on getting to know Tony Lam, the Sino-Vietnamese owner, born in Saigon, spending formative years living in and then running refugee camps in Malaysia, and then going to college and becoming a merchant. Tony kind of reminded me of my former boss and (former) guru Pansak Vinyaratn, who ran the magazine, and later the newspaper, that I worked for in Bangkok. He would wax philosophical about things and discuss them in mercurial ways that made you wonder whether he was really smart, borderline crazy or just messing with you. But I ended up staying and listening to him talk about his approach to ambient music and his food background until after the other journalists had left, and until after Susan had left. After dessert of pandan panna cotta (very much like the bay leaf panna cotta I had at Fireside; this might be a trend) and sweet coconut-banana tapioca, he ordered some cuttlefish for me to try. Tony served us lots of things that weren't on the menu, including raw green guava (underripe, the way they like it in Southeast Asia) with dried plum powder. That was sort of an intermezzo after the sweet-and-sour fish, if I remember correctly, which actually came after the lamb chops with eggplant, pear chutney and anise sauce. Tony also interspersed the menu with drinks, including a couple of flaming shots that we were supposed to drink quickly through straws. The problem with that is that if you're not quick about it your drink tastes like melting plastic, but I was quick. We also had a pretty remarkable Piña Colada flavored with crushed mint, giving it a cooling effect that somehow was in no way minty. In a cocktail that I think he called the Poison Ruby, lychee liqueur was made to taste even more lychee-like with the addition of rosewater. ... but really otherwise à propos of nothing, I was talking to a friend the other day who had just had tacos from a place with a weird name he couldn’t remember that he assumed was a local New York joint trying to copy Chipotle. I asked him if it was Qdoba. So I broke the news to him that Qdoba is in fact a national chain just like Chipotle is. Indeed, both are based in Denver. I didn’t break down the differences in the concepts — that Chipotle has a much simpler menu, all developed by its founder and president, Steve Ells, and all of the restaurants are company-owned, whereas Qdoba is largely franchised and has an evolving menu under the stewardship of strategic product development director Ted Stoner. Isn’t that a great name for someone who develops burritos? Sorry Ted, I'm sure you’ve heard it all before. Mercadito Cantina doesn’t have a full liquor license, just one for beer and wine, so drink consultants Tad Carducci and Paul Tanguay, the Tippling Bros., had to get clever. I was early last night for my dinner there, so while I waited for my friend Andy Battaglia, Tad gave me the low-down on the tric-quila. You know how tequila has sort of a spicy bite to it? Well, sake doesn’t, so they added chiles, white and black pepper and Sichuan peppercorns to it to simulate that bite. Tad poured me a taste. It’s pretty cool. Kind of tequila-like. It's used to make what the restaurant calls “Mentirosas,” which I think means liars or tricksters, because there’s not really any tequila in them. I started with a Paper Daisy, which is made with lime, agave nector and orange flower essence (and tric-quila) and is meant to taste like a Margarita. Andy was right on time and I asked him if his friends pretty much thought the world was going to end soon, maybe today or tomorrow (or the day after). He said that indeed some of his friends were gloomy. That’s going around a lot these days, and neither Andy nor I were able to determine exactly why people think things are so much worse now than over the past several thousand years (or past 500 million years, if you get right down to it). Remember how we were all going to die from avian flu a couple of years ago, and how Y2K was going to make planes fall out of the sky at the turn of the millennium? That's not to say the current dangers of economic collapse, environmental disaster, global political instability etc. aren’t legit, but those things are always around. Doesn’t anyone remember the Cold War? DDT? Thalidomide? The Second World War? The Great Depression? Hasn’t anyone read about the deaths of almost the entire population of North America from small pox in the 16th Century, the death of half of Europe from the Bubonic Plague in the 14th Century? Can anyone in the developed world even imagine a cholera epidemic? How about the asteroid that killed all the dinosaurs? I’m truly sorry that the polar bears are in trouble. I really am. But that’s not going to keep me from enjoying my tacos and taquiza. A taquiza is Mercadito Cantina’s version of a fajita. It’s served in corn tortillas rather than flour ones along with a choice of salsas, onions, cilantro and lime. We had the chef pick the food for us (I’m not sure whether it was chef-owner Patricio Sandoval or chef de cuisine Ivan Garcia, because the place was packed and so he understandably didn’t come out to chat). He sent out the carne asada taquiza (grass-fed skirt steak, marinated with hoja santa) along with the salsa verde and the salsa de cacahuate (peanut). He also sent out some head-on shrimp marinated in roasted garlic, and two types of tacos: estilo Baja, which had beer-battered shrimp, roasted habanero, avocado and cole slaw; and the pescado (tilapia in this case) with a poblano chile-tomato-garlic mojo. We had three types of guacamoles: traditional, chipotle (also with pineapple, pico de gallo and mint), and sandia (watermelon with habanero peppers, epazote and pico de gallo). And three salsas with crispy cornbread bites: Veracruzana (roasted tomato, capers, pickled jalapeños), habanero (with grilled tomato, garlic, lemon and crema fresca, as well as habanero chiles), and chipotle (with roasted tomatillo and garlic). We also sampled another Mentirosa, the Papa Low, made from passion fruit, an herb called papalo, jalapeño, salt and pepper. And we had a couple of Miches (prounounced "mitches"), which are the Tipplong Bros. riff on the Michelada, a sort of Mexican Bloody Mary made with beer instead of vodka. It’s not nearly as gross as it sounds. I had the ker~mich, made with cucumber, hoja santa, agave nectar, cumin and salt. Andy had the happy~mich, made with watermelon, lime, hot sauce (it says salsa picante on the menu, which sounds a lot better and means hot sauce), and hibiscus. We really, really did not want Marcel Vigneron to win the cook-off last weekend. I was in Milan (MY-lun), Ohio at the Chef’s Garden Food & Wine Celebration, the annual fundraiser for Veggie U, a program to teach elementary school kids how to grow vegetables. It’s a great cause, you can’t argue with it at all, and the Jones family, which runs Chef’s Garden, are such nice people that you want to help them. So when they asked me to help judge the cook-off, I said I would. Of course, they provided transportation and accommodation. And in fact it was transportation on Viking Corporation’s private jet, accommodation at the Cleveland Ritz-Carlton. So it wasn’t a sacrifice. Veggie U’s a charity, but Chef’s Garden isn’t. It’s a very high-end purveyor of precious little herbs and vegetables. We (six other passengers and I, including two guys from the The Food Network, journalists from Saveur and Food Arts, chef Joël Antunes and my fellow judge, Jody Eddy, who is the brand new editor of Art Culinaire) were picked up by Bob Jones, the family patriarch, who sets the aw-shucks tone of the family. The entire Jones family persona, you see, is so folksy and down-to-earth that it would be a parody if they weren’t absolutely sincere about it. See, Bob Jones is the founder of this multi-million dollar company that has something like 130 employees and charges a king’s ransom for tiny little microgreens and precious little vegetables. And many, maybe most, of the top chefs all over the country gladly pay for it. They use top-of-the-line technology to analyze their soil quality, have designed their own ergonomically sound farm equipment for ease in working the land, and are starting to do DNA testing for dangerous types of salmonella and e. coli. They have weeding machines that shield their laborers — Mexicans who are paid about $11 an hour, have work visas and are flown by Chef’s Garden to and from Mexico annually — from the sun as they lie on their stomachs inches above the soil and pick weeds as the machines move over the crops. It’s quite cool. It was Bob’s idea, after his more conventional vegetable crop was wiped out by a hailstorm and he was driven to bankruptcy, to rebuild by growing food to the specifications of chefs. That’s the story told by Lee Jones, Bob’s son and the face of the company, whom I’ve written about here before. His brother, Bob aka Bobby, does the planting while Lee does the marketing. Lee seems still to be under the impression that he’s helping to run a small family farm. Again, this would be crazy if he didn’t believe it. 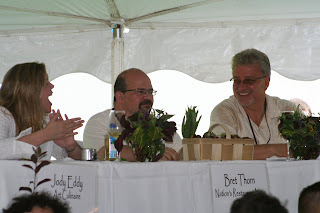 So that’s the Joneses, this was the Veggie U Food & Wine Celebration (held near Chef’s Garden, which is in Huron, Ohio, at the Culinary Vegetable Institute — a sort of chef’s retreat and test kitchen), and Jody and I (and a chef and writer named Fred Mensinga) were judging a cook-off. 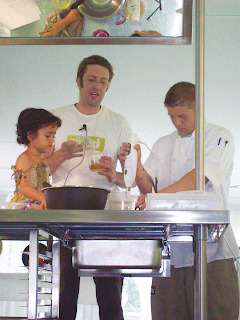 Okay, actually, the day before the fundraiser was the Chefs Summit, which is mostly a series of 20-minute cooking demonstrations by chefs, including Will Goldfarb, pictured here with his almost-three-year-old daughter Lulu, who was helping him. So was the local volunteer, pictured on the right. It’s worth noting that nearly all of the chefs who did demonstrations did something with molecular gastronomy. Will did many things with molecular gastronomy, but that’s part of his schtick. He and Lulu made a pomegranate-beet mousse using some of his hydrocolloids, his point being that using great products and the latest techniques are in no way contradictory but in fact go hand-in-hand, and that by using a few grams of powder you can really highlight those products at their most pristine (unless you just eat them raw). And it’s so easy a three-year-old can do it. While all of this was going on, I got the chance to get to know Joël Antunes, who recently moved from Atlanta to New York to be the chef at The Oak Room, which is scheduled to reopen later this year. The picture of Joël, on the left, is an old one that was used in the 2001 profile that my former colleague, the late, great Jack Hayes, wrote of him. But he looks about the same now. Joël (his surname is Basque, and is pronounced an-tu-NESS) spent much of his childhood in sub-Saharan Africa, where his father worked for Michelin (the division that makes tires, not guidebooks) and bought rubber. In the late 1980s and early ’90s, he spent about four years in Bangkok, where he worked at The Oriental hotel, at Le Normandie restaurant, in the same position that Jean-Georges Vongerichten held before him. There he raced motorcycles and otherwise enjoyed himself before returning to the West. He’s very cool, and I’m looking forward to The Oak Room opening. Jody Eddy is very cool, too. She was a cook, and among the places she worked was The Fat Duck, so she has an opinion about molecular gastronomy. She pointed out to me that it could take Fat Duck chef Heston Blumenthal and his team two years to develop a dish. Other chefs try to rush the process, which is why the results are sometimes so bad. But she doesn’t seem to take that very seriously, and she has a chef’s stamina for partying, sleep deprivation and salty language. We were engaging in the last of those while much of the cook-off was going on, the one that we (and Fred) didn’t want Marcel Vigneron to win. Because Top Chef is stupid. Well, okay, maybe not stupid. It’s entertaining enough if you like that sort of thing, but we don’t. It’s the celebrity chef phenomenon at its most banal, its fans seem to care more about personalities than food, so the show (or to be fair, its fans) fosters the sort of celebrity chefdom that degrades and distorts what working in a professional kitchen is all about. And he was competing against the delightful Celina Tio, who is just now leaving The American Restaurant in Kansas City to open a place of her own in Charlotte, to be called Julia(n), and the well-respected Don Yamauchi of Forte, in Birmingham, Mich. The three chefs were on stage, frantically cooking, while emcee (and chef) Bob Waggoner, along with co-emcee, tie-breaking judge and local celebrity chef Michael Symon entertained the audience and Jody, Fred and I sat on a dais in back of the audience and chatted. I also nibbled on the cardamom shoots that were one of the ingredients the chefs had to use (the others were black cherry tomatoes — another Chef’s Garden specialty — and the pork tenderloin and grass-fed beef filet provided by the sponsors). Then we went on stage (that’s a picture of us on stage), tasted the food and commented on it while marking our score cards, hoping to hate Marcel’s food. But what can I say? His food tasted the best, and we’re all judges with integrity, so he won. The competition followed the fundraising tasting event, which was also a competition of sorts, as the chef that one of the sponsors liked the most was given a free trip to Spain to eat at elBulli. And the winner was Aaron Deal, the chef of Tristan in Charleston, S.C.! Can you believe it? Well, sure you can. Aaron’s a good chef and a nice chap. Here he is, on the right with Lee Jones and sous chef Wes Grubbs. He made Manchester Farms quail with carrot purée, baby carrot, and Benton’s Bacon. The chef who was cooking next to him at the tasting event, Craig Deihl of Cypress restaurant in Charleston, took the grease from the bacon and used it, instead of oil, to make bacon mayonnaise. I recommend that you try this at home. “please come by 10:30-11Pm tonight for some bubbly!" That was Ben Pollinger, the executive chef of Oceana, which got a three star review in The New York Times yesterday. I e-mailed him my congratulations, he e-mailed me an invitation for sparkling wine. We both win. And I had visiting out-of-town colleagues Robin Allen and Catherine Cobb, and that meant an after-work drink or two, giving me the opportunity to linger in Midtown until Oceana closed and the party could start. The restaurant’s on 54th Street, between Park and Madison avenues, just two blocks from our Park Avenue office. It was a relatively small, quietly exuberant affair, with very brief speeches from Ben and executive pastry chef Jansen Chan, Champagne, and a banana-cashew cake with chocolate ganache and white chocolate butter cream. I even asked Nick that, and he said that to get a four-star review you basically had to run a non-profit restaurant. He also talked about the new restaurant he was opening, Burger Deluxe, in Wayne, N.J., which will be a pared-down version of his City Limits Diner chain. Jim Botsacos, the Livanos group’s corporate chef, was so excited about the new place that it almost made me nervous. 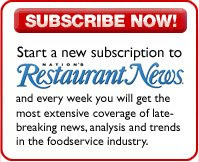 Boy, what a great story for Nation’s Restaurant News! (he said) How a savvy restaurateur takes a great concept and refits it for a smaller space in New Jersey! Jake Addeo, the chef at Abboccato, was there, too — proof that rumors of his departure were wrong. All of those people are part of the Livanos group of restaurants, but Tony Esnault isn’t. He’s the chef of Adour, Alain Ducasse’s wine-oriented place, but he was at the party, too. “Do you work here?” he asked me, which is funny since he and I were among the only people at the party who didn’t work for Nick Livanos — us and a guy from Rachel Ray or Martha Stewart or someplace like that who was hanging out with the young publicists from KB (now KB/Hall), which represents the Livanos restaurants. It was a perfectly reasonable question. Maybe I’d changed jobs. Tony goes to a lot of chef parties, which I wouldn’t really expect from a Ducasse chef, and that just shows what I know. But I mean you expect someone who works for Alain Ducasse to be aloof, snooty and way too cool to hang out with other chefs. I kind of expect that from New York Times writers, too, but in fact the ones that I’ve met are quite nice. Then again, I tend only to meet them at parties at the top of my social stratum. Either there or just randomly on the Internet. Eventually I settled in to conversation with Jansen, who was kind of mentally parsing the Times review while handing out pieces of cake. Jansen wondered about the word “splendid.” Where, exactly, did it fit in the realm of quality? Better than “good,” surely. But maybe a hair short of “excellent”? Mr. Bruni especially loved the frozen banana mousse, which is funny because Jansen took it off the menu on Monday, replacing it with a dish of peaches & cream with croissant ice cream. The ice cream is made by making a crème anglaise without vanilla, freezing it and then mixing pieces of baked croissant into it. Jansen leaves the vanilla out because he wants the toastiness and yeastiness — especially the yeastiness — of the croisssants to come through. He also garnishes it with croissant crumbs, if I remember correctly. The idea came to him when he was eating a croissant with peach jam and butter. Because of the toastiness, people think there’s coconut in there, but what they're tasting is the toastiness which they associate with toasted coconut. Funny how that works. Kurve is finally sort of open. Kind of. The East Village restaurant where Andy Yang of Rhong-Tiam is in charge of the food and Karim Rashid (Morimoto in Philadelphia) did the design is doing reservation-only service to control customer flow and make sure the staff is ready. Its opening party was last night. It was supposed to be on the 8th, but I don't think that one happened. Even for this one I was only invited yesterday afternoon. But I love Andy’s food at Rhong-Tiam, which was a sleepy little place until the Times wrote about it a few weeks ago, (and now you can't get in, so good for them), and thought I’d check the place out. Kurve’s totally different, much more high-concept (fusion food, not Thai), trying much harder to be a scene. Several large African-American bouncers blocked my way as I approached the door while one of them looked up my name on a list. Inside was a small crowd, and a host who I think was named Jeremy and seemed to be hired just for the party. He offered me a cocktail, I asked what was good, he suggested a Mojito, I took it. I later learned that Sasha Petraske was doing the drinks and wondered why I was offered a mere Mojito, but the place is new. I don't know from décor, but the restaurant was definitely curvy, dominated by an irregular-shaped bar, curvy shapes on the walls, a floor that I think I'd call Morimoto-green, although I can't be sure as I'm partially color blind. Plasma screen TVs, too, embedded in the walls. Odd, it seems to me, for Second Avenue and Fifth Street. Thank goodness Steve Bryant from Thrillist was there, so he could explain to me who the important scenesters were at the party (such as a TV co-host from a show I never saw, I forget the name), and also because he's a congenial guy who's pleasant to talk to. At Rhong-Tiam, Andy’s a low-key, casual guy, but this was an opening party and he was decked out. I'm not sure exactly what he was wearing as I couldn't get past his hair, which was tricked out with gel to help him look like an animé character. He had me pose with him for a photographer from Thailand’s Praew magazine, which, if I remember correctly is kind of a big deal in Bangkok. I switched from Mojitos to Chimay and settled in for a chat with the Thrillist people. As you'd expect from a scenester opening, not much food was served. I did manage to score some edamame, a bit of pork wrapped in sticky rice and served with a spicy-sour Thai dipping sauce, and also some ovaltine-milk chocolate pudding. Underfed and full of beer, I stopped by Cooper 35 for cheap kimchi fried rice (I think it was $6) and called it a night. A lady opened her refrigerator and saw the Easter Bunny sitting on one of the shelves. "What are you doing in there?" she asked. The Easter Bunny replied: "This is a Westinghouse, isn't it?" to which the lady replied, "Yes." "Well," the Easter Bunny said, "I'm westing." Bugs is, without doubt, the paragon of comedic timing and obscure references. At the [ASFS] conference in New Orleans (wish you had been there) I was entering Antoine’s with a group of people, and started the schtick which culminates in “Louisiana Back Bayou Bunny Bordelais a la Antoine - Not the Antoine of New Orleans? - I don‘t mean Antoine of Flatbush!” No one had any idea what I was talking about. No one ever gets the “peng-oo-ins is practically chickens” bit. Wabbit season, Duck season, Elmer Season. Have you considered how many Warner Brother’s cartoons are all about food? Everyone is just trying to avoid being eaten. And nearly everyone is food. Bugs, Daffy, Porky, Foghorn, Tweety, Roadrunner - there's a dissertation in here somewhere. Good point. But of course, most of the characters are animals, and what are animals for if not eating? Unless you’re a coyote, in which case your purpose is to fall down steep canyons and get hit on the head with anvils and 2000 pound weights. Interesting observation how many cartoons are about some characters trying to catch food, and other characters avoiding being eaten — yet there is almost no actual eating going on. Bugs has a carrot he never finishes, as far as I know, Yogi and Boo-boo steal the pic-a-nic baskets, but almost never enjoy the spoils, and ants at a picnic may carry away the entire cake but they eat it off camera. Jerry and Tweety may get as far as Tom or Sylvester sprinkling them with salt and pepper, but they always make good their escape while their potential diners are tying on the napkin and licking their chops. The gags, therefore, to me, seem to be more about hunger than about eating. Wily, the hapless coyote, is starving and desperate. Elmer is a glutton, and his hunger is less edgy, but no less laughable. Tom is forever pulling out a fish skeleton and gazing on it forlornly, with longing, before his mind turns to Jerry. The cartoons may have something to say about nature — long in tooth and claw — but I wonder if they don’t say more about our attitude towards hunger, and those unfortunate creatures who, in this land o’ plenty, are down and out and reduced to pulling figurative fish skeletons out of the garbage, and whose thought balloons contain images of pigeons morphing into roasted Thanksgiving Day turkeys with all the trimmings. “This is Georgea,” said Jennifer Neugeboren. She pronounced it "geor-GEE-uh." Jennifer's a newbie publicist at Baltz & Co., having been there for three months, and Georgea is their intern, a recent graduate of the French Culinary Institute. I asked Georgea what ethnicity her name was. “What’s your last name?” I love Greek last names. The longer the better, perhaps because my own last name is so short, lacking even a silent 'e'. Not long, but interesting nonetheless. “What a great restaurant family name,” I said, because of course the Pappases are a near legendary family of restaurateurs in Houston — owners of Pappas Restaurants Inc., which includes perhaps the greatest list of restaurant names in the history of the planet: Pappadeaux, Pappasito’s Cantina, Pappas Seafood House, Pappas Bros. Steakhouse, Pappas Bar B-Q, Pappas Burger, Pappas Grill & Steakhouse, and Yia Yia Mary’s Pappas Greek Kitchen. “That’s my family!” said Georgea. Hurray! Georgea is in fact the daughter of Christopher Pappas, who, apart from being a principal in his own company, is the CEO of Luby’s. In a small modification of Greek tradition, all of Mr. Pappas’s children, men and women, have Christopher as their middle name. This often caused confusion on the first day of school, when teachers expected Georgea to be a burly Greek lad, which she is not. Not even close. We were at Elizabeth, a two-month old restaurant in Nolita, where the consulting chef is Doug Psaltis (Greek) and the executive chef is John Iconomou (French — just kidding; he’s Greek, too). Both chefs are veterans of Country, owned by Armenian chef-operator Geoffrey Zakarian. I’m sure Turks are nonetheless welcome at Elizabeth. I speak to Pichet Ong from time to time. We have mutual friends and see each other at parties, and of course he’s a chef and restaurateur and I’m a food writer. Our circles overlap. There has been a common thread in our conversations ever since he opened P*ong in April of 2007. “You haven’t been to P*ong yet,” he says, every time we talk. And of course he’s right. It’s his restaurant, and it’s a small place. He can tell. So last night I went. I just showed up and asked if they had room for one person to eat, and they did. Pichet seemed almost shocked, and possibly nervous, but maybe not. He might have just been distracted; he was about to leave for Copenhagen for a consulting gig. Good for him. As an aside, if I may speak on behalf of all writers and editors, which of course I cannot, if you’re wondering how we like the use of asterisks and such in the names of restaurants, we don’t. But I do like Pichet. vegetable-infused vodka (celery, bay leaf, yellow beets, coriander) mixed with carrot juice, orange juice, and served with a Chantenay carrot strip pickled in rice vinegar and sea salt. It's served in a glass rimmed with ginger molasses. The carrot strip is sort of accordioned onto a skewer, which, along with the fact that the edges are darker than the center, makes it look like a pink bacon strip. Funny, given the name of the drink. Pichet says it’s not intentional. Whatever happened to Tim Kelley? About a month ago, I’m pretty sure I saw Tim Kelley on the subway. I should have said hello, because I can’t figure out what he’s doing these days. He was quite the hot number around the turn of the century, when he was the executive chef of The Painted Table in Seattle. Then he moved to New York to become chef of Zoë for about ten minutes before leaving to travel in Southeast Asia, from which he wrote a blog called The Runaway Chef, which has now vanished from cyberspace. Do you happen to know what happened to him? If you want to know about how to cook a large lobster and don’t care about my personal life, scroll down to the bold type that says “How to cook a big lobster.” If you have questions, feel free to ask me. I turned 41 last April, but last weekend my dear friend Michael Gerber decided he wanted to throw me a 40th birthday party. Michael’s brilliant, but deliberative. Sometimes his plans take awhile. “I have a lot of marine protein and the biggest lobster you’ve ever seen,” he said. He’s a science teacher, having majored in biology in college, and so he talks like that. So does my buddy Birdman, aka professor David Krauss, who teaches college biology and has a new girlfriend who has an internship in Boston this summer. Michael lives in Gloucester, Mass., so it was convenient for Birdman to drive me up. And he was invited to Michael’s party, too. So was good old Shane Curcuru. Loyal, good company and with a comfortable couch to sleep on, which I did on Friday. Shane also took the picture of the lobster that you see above. The party was on Saturday, and involved the four of us standing around drinking and preparing food. Michael’s an innovative cook, so, not having horseradish, he used wasabi instead to make cocktail sauce (by adding it to ketchup), which we could use with the raw clams that he and Birdman shucked. Then they went outside to hack up scrap wood to light a fire (Michael has a stove, but he wanted to make a fire as it is more manly) over which he put a cast-iron skillet to sear scallops, which he just dusted with Old Bay. Eating scallops in New England makes me angry, because it reminds me of how humdrum they often are in New York. Michael’s were sweet, rich, and with a great texture — just cleaving from our teeth as we bit into them. I gave Michael grief for buying a 13-pound lobster, because, you see, large lobsters like that are important for the lobster gene pool. Unlike the smaller ones, which kind of stay put, big lobsters wander up and down from Cape Cod to northern Maine, breeding as they go. Also, large female lobsters are extremely fecund. They’re so important to the fishery that in Maine it’s illegal to sell lobster that’s longer than five inches from the rear of the eye socket to where the tail starts. Michael says Massachusetts bans catching big lobsters in traps, but if they happen to be dragged up in a trawler, they can be sold. “Is it male at least?” I’d asked. It was a good question. None of us really had an answer. ... “That’s pretty!” said Michael's four-year-old son, Gilad, who was not invited to the party but he wandered in anyway. “I want to set it free,” Michael said, suddenly squeemish, and not because of Gilad’s reaction. We’re just not accustomed to eating animals older than we are. I suggested it probably wouldn't survive if we set it free. It had been out of the water for awhile. It seemed to still be alive — some of its parts were moving a bit — but it was sluggish. We ended up taking it to the nearby harbor and setting it in the water to see if it perked up, but instead it started dripping something oily into the water, which isn't something healthy, living lobsters do. So we took it back and cooked it. (By the way, the lobster was a male. Birdman sexed it for us. You know those little rows of fan-like appendages on the bottom [ventral] side of lobsters? On females they're all about the same size and shape, but on males the front [anterior] pair is smaller, skinny, and can be brought together to form a sort of channel for squirting reproductive material into the females, which is exactly what it’s used for. All four of us are good cooks. Shane’s a terrific baker, but he also had made me delicious omelets for breakfast that morning. Birdman’s the biggest purist of us — fish with beurre blanc, lamb with garlic, perfect crème brûlée — but also the one probably to have thought the most about the science of cooking. Michael’s into finding cool flavor combinations (wasabi and ketchup, as discussed, but he also made three different fish pâtés for us to play around with, and really, why not flavor white fish with single malt?). I’m the only one in the group who went to culinary school, but so what? None of us knew how to cook a 13-pound lobster. Birdman suggested we par-steam it and then pull out the meat and cut it up for cooking, which we did. The little legs were perfectly cooked once the lobster turned red, and so we ate those, and they were delicious. So was the knuckle meat. Michael sautéed the claw and tail meat in butter, but some of it was quite tough. But at that point we were full anyway, so I suggested it be cooked in moist heat at low temperature until the meat softened. August 18 update: I asked Charleston Grill chef Bob Waggoner about how to cook a 13-pound lobster when we were at the Chef’s Garden’s Food & Wine Celebration. He’s a terrific chef, but he said he wouldn’t even try to cook it. 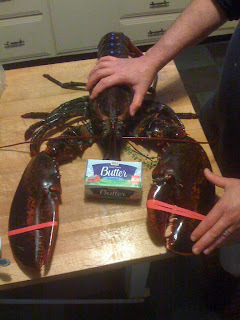 May 20, 2010 update: I recently spoke with Michael about our lobster experience, and he surmised that the main problem was that it wasn’t a very good lobster, having recently moulted its shell, making for watery, stringy meat. Our method probably would have worked better on a better lobster. That would be mad chef David Bouley and nutritionist Oz Garcia, in Bouley’s test kitchen, which is a grand space in back of his Tribeca offices, complete with cookbook library, multimedia doodads, funky spotlights and other things that might be necessary for photography, and seating for, oh, I don't know, 40. I was told that the last time Bouley did a tasting people were still there after midnight and was assured that wouldn’t be the case on Thursday. But here’s the thing about David Bouley, and you just have to remember it if you’re going to enjoy his food: He is completely unaware of the passage of time (or at least he acts that way). He has been that way for a very long time. I’ve heard stories dating back to his first restaurant, Bouley, which he closed a decade ago, about people sitting in the dining room for hours and hours as their meal progressed at Bouley’s pace. I completely understand why that's not acceptable to some people. But I’ve been shocked by how good his food is for so long (I first had it in Bangkok, I think in 1996, and it made me want to giggle), that I’m willing to wait for it. But an “informal tasting” should be a brief affair. Theoretically, it started at 7, but when I arrived at 7:20 and was brought up stairs, the chef was sitting at his computer (remember, the test kitchen is in back of his offices). We had sat down by 8, and Bouley spoke for awhile about his philosophy about food and how it should be good for you, but must also absolutely be delicious. This, he pointed out, was something the Europeans and Japanese had managed to do for many centuries. You might think he was talking about food that’s good for you because he and Oz Garcia are doing the food at a resort in Anguilla, but he actually has been talking about it for years. Back in 1999 I interviewed him for a piece Nation’s Restaurant News was doing for our end-of-millennium special, and he talked about trying to get people addicted to food that was good for them instead of food that was bad for them. Below, I’ll list what he served, but also, an update for those waiting for his new restaurant to open: He said it would be another two to three months. He’s also going to open a Japanese place in New York, featuring mostly cooked food with just a bit of sushi and sashimi, in the next eight or nine months. But remember what I said about his concept of time. Speaking of which, I left the test kitchen at around 12:30 a.m., but a number of diners had departed earlier. I walked out with some of Bouley’s cooks, who expressed sadness that guests left early, pointing out that the meal was intended to reach a crescendo at the end. When I’m being wined and dined, I tend to stick around for as long as possible, but maybe I’m just a shallow hedonist.